Before you can build and tile the roof of a building, you'll need a frame to work off of. And when it comes to framing a roof, two methods currently dominate the construction industry. You can either build rafters and stick frames by hand or you can use a prefabricated roof truss. Today, the majority of construction companies prefer to use trusses whenever possible. With a variety of popular designs available for purchase, roof trusses allow for more efficient, significantly faster construction at lower prices than were previously possible. They're not always a viable roof framing solution, but when they are, they're a beloved tool in the industry. Essentially, a roof truss is a prefabricated frame of supports designed to go on top of a building as it's being built. Easily attached to the rest of the building's frame, they circumvent the complicated, expensive nature of from-scratch roof framing and can be purchased in a wide variety of designs made from either lumber (commonly used for homes) or metal (primarily used for commercial buildings). These trusses are computer designed and machine cut, sized for the building they'll be attached to and shipped out on trucks for easy installation. 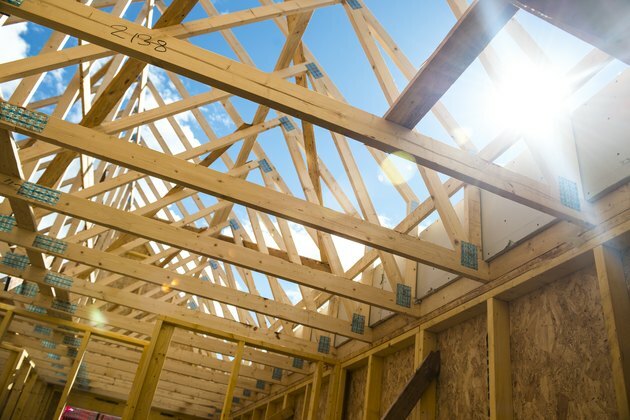 Roof trusses are relatively inexpensive when compared to traditional stick framing, as the amount of time and labor needed to lift and install a truss is thousands of dollars cheaper than the alternatives. Most roof trusses are designed around the same basic arrangement: A roof truss is a frame that supports a load of weight by transferring the force of that load to its end supports and is generally built from 2x4 members or metal girders arranged in intersecting triangles to accomplish that goal. While all roof trusses are sized for the building they'll be attached to, the various truss designs serve different functions. And, depending on the circumstances – the purpose of the building, the region it's being built in, expected weather conditions, etc. – one truss type may be more or less appropriate than another. Standard or common trusses are the most commonly used designs, allowing for the "default" triangular sloped roof, while energy trusses modify that design slightly with a few extra supports, making for a slightly taller roof that can more effectively be insulated. End trusses can be used to transfer the weight of a load to the building's foundation, and room-in-attic designs are used to – as the name implies – allow for the construction of an additional room within the space of the building's roof. While a roof truss offers financial and timeline benefits, they're not always the best option for a construction project. There are still a range of situations where on-site framing methods are more desirable – and if a truss can't be shipped to the construction site safely, stick-framing and rafter building will be the only option available. On-site methods are more effective in building designs featuring high-vaulted ceilings or in situations where designers wish to maximize storage space. Rafters allow for easier expansion into the upper floors if an owner wishes to add another upstairs room after construction, and in some multi-floor plans, the rafters are used to allow for walk-in closets or general storage spaces. While roof trusses built with attic rooms in mind are available, these designs are less likely to maximize the useful space in the area – and in general, roof trusses are incredibly difficult to customize or adjust on-site. Trusses are cheaper and faster to implement, but traditional roof framing methods will be hand-tailored to the building.